Not surprised BV wasn't able to get any info on this. The owners of the venue have never hosted anything of this magnitude and don't appear to have any connection to the Stones. In fact, they really only host one or two smaller festivals a year, with about 50k attending over 2 or 3 days. Never hosted a large single event like this since they purchased the property. The Boots and Hearts Fest looks like quite a hoot and very well organized w/a variety of GA and assorted VIPS, not to mention plenty of camping options at various price levels. I was under the mistaken impression based on what I read here it was just a massive empty field similar to Yasgur's Farm in the middle of nowhere. Edited 1 time(s). Last edit at 2019-02-11 09:35 by Hairball. *also- more expendable money in the Barrie/Orillia area than all the other locales on the tour? Looking forward to the update. Oh, you're talking about cottage country. Those cottages aren't exactly cheap properties either. Everything I posted is accurate. They have never hosted a single large event show like this. Boots & Hearts, which I alluded to, is a 3 day festival. This is a big deal for this place and area. I'm still surprised they are playing there but good for the venue, that's an awesome show for them. If you don't have anything to contribute maybe you should worry less about me. Didn't think ole Jeets would take all his nonsense being called out very well..
You took a post literally and have made it your life for 3 days. What a sad life you must have. Also, I didn't see you with any info on this show. We were all speculating, except for the one guy who called it. Taking it worse than I thought tho.. Relax, Jeets. It's just embarrassing now. Not sure what you're talking about, but I'm glad to have made you laugh? I try to provide truthful info when I can. 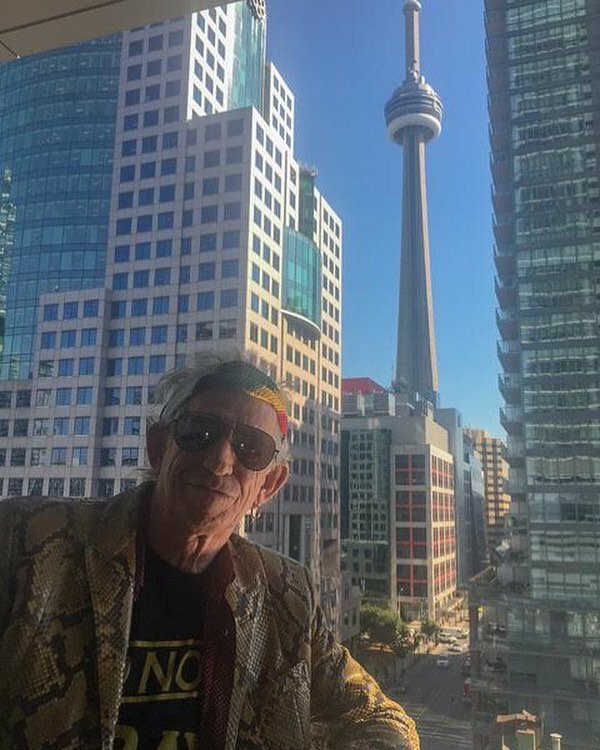 Keith sure gets around - one minute he's in L.A., and the next he's lurking in the shadows of the CN tower in Toronto! Pit ticket question: Pit tickets have a "Row" number. What does the Row number mean? If it's similar to what's been done in the past, it's just an internal number that enables them to keep track of tickets sold. Means nothing to the ticket holder. NJ June 17 PIT.1. (Ronnie side) available ! Now Ticketmaster says "Oh-no! These tickets went fast and we're unable to find more right now." EDIT: never mind, it's back on. Yes, Pit 1 available for 499+fees. Edited 1 time(s). Last edit at 2019-02-13 10:37 by Topi. if you want buy it, please try continue. I checked it right now and I could still buy 1pcs. I choosed 1 pcs again and the site bring me to the next page where I should choose where I live. Edited 1 time(s). Last edit at 2019-02-13 10:39 by rstass. Yeah never mind, I see them now. I would be able to buy four of them. Have Lucky Dips already for that show, not getting the pit at this point. Final show in Chicago, Pit on Ronnie's side is $804 fees included right now. That's the lowest it gets. So glad I got my tickets the day of the fan presale! 2 rather decent seats in E. Rutherford for only $237! $804 with fees is the lowest I've seen Pit tickets in the big markets. That's a face value of $680. I would wait until they play the first few shows and you can get a look at how big the Pits are and how the stage is built out into the seats on the floor to determine your best options for the final shows in NJ and Chicago. Yes, but they should continue to drop - it was higher not too long ago. So far I've seen some VIP's in the stands converted to Platinum/muchlower prices. And some of the Platinums throughout have become less expensive - especially singles. I've also seen a large block of about 50 standard priced tickets magically appear in section 136 at standard prices (surprisingly most of those are now gone at $395+ each). There's loads of Start Me Up and Jumping Jack Flash VIP's currently available, and most, if not all that haven't sold yet are sure to be converted eventually. And then there's all the verified resales - the sellers might start feeling the pressure closer to the show and have no choice but to lower prices. Jeter1984: you're talking about "Big markets"; do you consider MetLife a big one? For MetLife #2, they had face value pit tickets for Ronnie's side for several hours early this morning. 499+fees.